WELCOME TO OUR 100TH CHALLENGE!!! 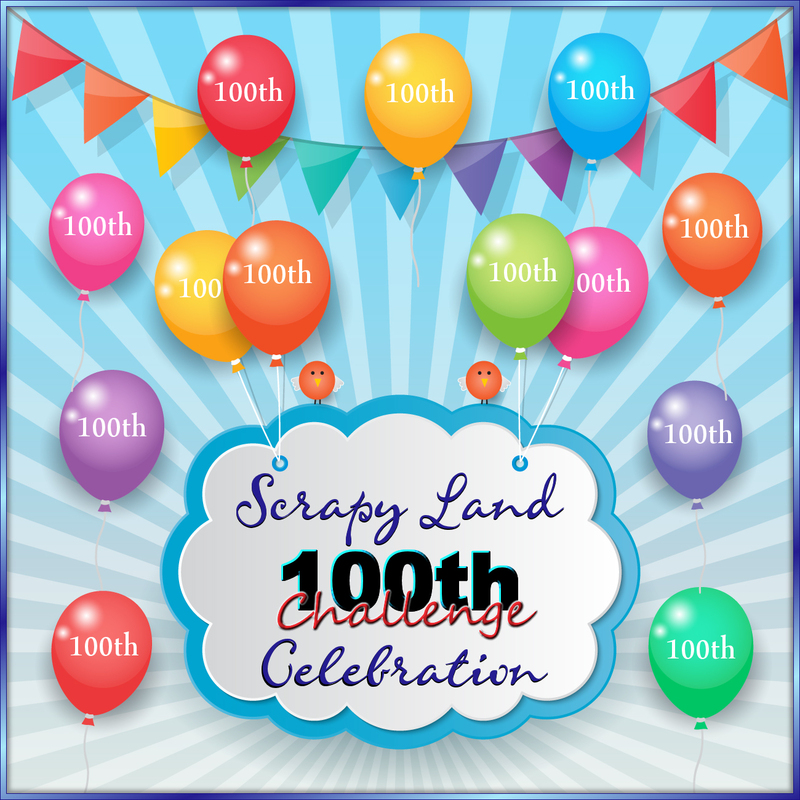 The Scrapy Land 100th Challenge is finally here and all the Designers' are so glad to be sharing this major milestone with you! We are having a CELEBRATION and YOU win the prizes! We are so excited to share this huge milestone with you. The Designers' theme is Celebration and we encourage each of you to join along with our theme (any type of celebration). However, the Anything Goes theme is also an option. Jess - you are here!! Now for a bit about my project! I used the Elizabeth Craft Designs - Lilac 2 to create this beautiful card! NOW, this card has exactly 100 double layered flowers on it - REALLY! I know because I counted each and every one as I created!! I simply cut all the layers, then used a Liquid Glass product to combine the layers (I used tweezers). Next, I stamped 100 onto a piece of cream cardstock using a purple ink. I used this as my template to adhere my flowers! Next, I simply started attaching the flowers to fill in the numbers! 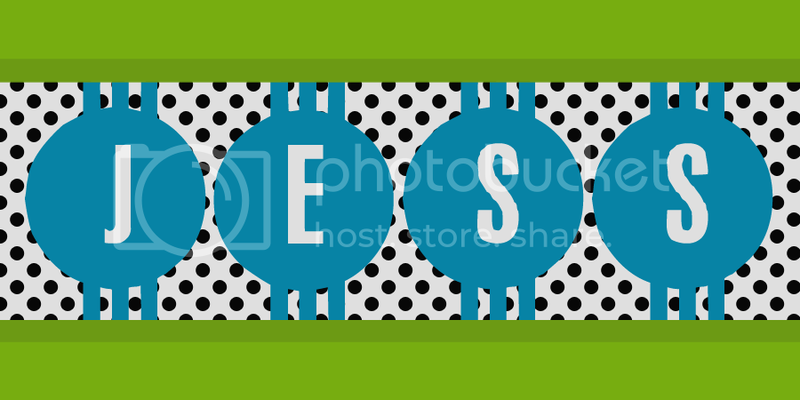 Once the numbers were filled in, I added the leftovers to the edges to create a border. To finish off the flowers, I used a bit of Green Crystal Drops. I think that this card fit the 100th Celebration perfectly!!!! We can't wait to see what you create for this Special Occasion! It can be any style you like from CAS to mixed media and everything in between. 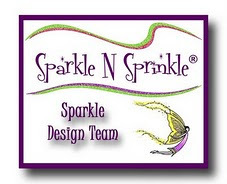 Just be sure a die cut from any brand that Scrapy Land sells is included on your project. Don't forget to Share this with your friends for additional chances to win one of the FABULOUS prizes. You have until Nov 4 to join our Scrapy Land 100th Challenge Celebration. This gives you an extra week of crafting time to upload your special Celebration projects below. 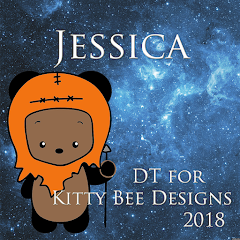 Your next stop is Tiphanie to leave a comment there as well, or to continue along on the hop until you have left comments for each of our Designers. I would totally lose count with all those tiny flowers! What a fabulous effort! Love this creation! I did lose count a couple times! LOL Thanks! Wow, you did an amazing job on this! I can't imagine the time but wow, the end result is beautiful!! SO pretty! My favorite color Is purple and I am loving your pretty card. Perfect for the celebration. Love It! I am a new follower. Awesome card! Love those lilac flowers! Love the pretty flowers. That had to take a long time. Great card. Wow, this is amazing Jess! Love how you created 100 tiny flowers for your card. Yeah! I hope you have a lot of fun with it! How cute and creative! I just love the sweet little purple flowers! Wow - this looks amazing! And I bet it was a lot of work! Thank you! It sure was - but I love how it turned out! Oh my goodness!! That must have taken you forever to make! I love all the flowers together to make the 100! Great idea for the 100th Challenge!! Awesome card and a labour of love. Reminds me of when my daughter was at school and they celebrated the 100th day of class. My mom sewed 100 daisies on a black T-shirt :-). Love the colours you used! Thank you! OUr school doesn't do anything for the 100th day...but it sure would fit the bill! What a unique way to use the lilac die. Love your creation. Oh how fantastic! Love your floral 100, lots of work there, but such a pretty and unique effect! Happy 100th! What a great idea to make your creation with 100 tiny flowers!! Love the end result Jess! You must have had lots of patience to make this one Jess. Thank you for sharing with us over here at World Wide Open Design Team Challenge and best of luck with your entry. Hahaha! Yes - it was fun though! :) Thank you! So very pretty..love the end result after your hard work.. Thank you for sharing with us over here today at the Classic Open Design Team Challenge and best of luck with your entry. So very beautiful with all those pretty little flowers on the card. I like that you used them to make the 100 as well. You really put lots of time into this but it sure paid off. Love your 100 idea. It is brilliant. Wow congrats on 100th Challenge and what a lovely project you have created for it with all those gorgeous flowers. Nice work. Thank you for sharing with us here today at World Wide Open Design Team Challenge and best of luck with your entry. Wow- what a great project to celebrate the 100th Scrapyland challenge! Love it! 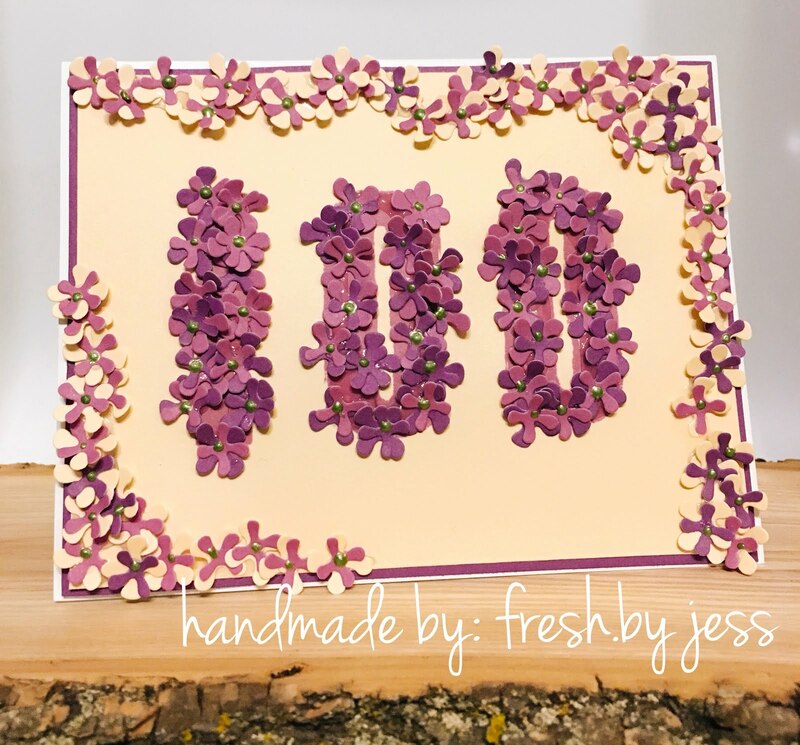 What a pretty, clever way to create 100! I would have had to start over with counting - several times! hahah - I did have to a couple times ;) Hence...my rows! Beautiful creation Jess, love how you used the flowers! Wow!!! 100 double layered flowers to celebrate 100 challenges is really the perfection! And such creative way to use these tiny flowers!!! Fabulous card! This is just beautiful Thank you for sharing with us over here today at the Classic Open Design Team Challenge and best of luck with your entry. WOW Jess, your card took lot of love and attention... It's beautiful! How fun to be on the Team for this big event. Wahou ! Que de fleurs découpées pour fêter le 100ème challenge de Scrapy Land. Wow! What flowers cut to celebrate the 100th challenge of Scrapy Land. Wow.. what a clever idea with all the pretty flowers!!! Beautiful colours, too! I love this card. I can use this also for birthday cards and.... Thanks for the idea. Absolutely love your message with flowers. 100 Challenges for Scrapyland! Amazing! Love your project! I am inspired! Wow! This is a lot of cutting and gluing. I admire your patience. A lovely project, thank you for joining us this week. Thank you for sharing with us over here at World Wide Open Design Team Challenge and best of luck with your entry. Cute N Crafty Challenge #12 - Anything Goes!